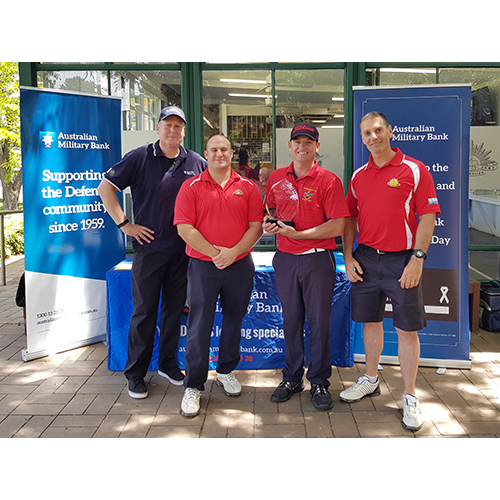 Australian Military Bank has once again proudly hosted the annual White Ribbon Charity Golf Days to promote awareness for domestic violence against women. The golf days were held on November and December 2018 at three different locations: Royal Military College Golf Course, Duntroon; Kapooka Golf Course; and Cerberus Golf Course. Over $8,000 was raised with all proceeds going to White Ribbon Australia. We would like to thank all those who were in attendance, assisted in organising the events and, donated to this worthwhile cause. Image: Winning team of the inaugural White Ribbon/Australian Military Bank Perpetual Trophy, ‘Ground Under Repair’, at Royal Military College Golf Course. Pictured left to right: Regional Manager, Andrew Moebus, CAPT Ben Moroney, CPL Terry Flaherty and MAJ Travis Axford.